Sunderland chairman Niall Quinn is still hopeful the club will have a new manager in place by Monday. But he refused to comment on reports linking former Manchester United skipper Roy Keane with the post. "We are in negotiations with someone who has not yet said yes and has not said no," Quinn said. "Nothing has collapsed but nothing has been finalised either. There is an outside chance the new man could be in charge for Monday's game." Sunderland play West Bromwich Albion on Monday and it had been expected that 35-year-old Keane, with Brian Kidd as his assistant, would be in place then. A club statement has said the Black Cats were in discussions with a high-profile figure and Quinn added the would-be manager "will be a world-class attraction any club would be proud to have". He added: "We are still confident that it is on track." Keane and Kidd worked together during their time at Old Trafford before the latter left his post as assistant to Sir Alex Ferguson to take over as manager of Blackburn. The 57-year-old Kidd also had a spell in charge of Leeds and formed part of former England manager Sven-Goran Eriksson's coaching set-up until a forced break from football to overcome prostate cancer prior to Euro 2004. He would act as the experienced head to help guide Keane, who played with Quinn during their international careers with the Republic of Ireland. The Irishman also share the same lawyer and agent in Michael Kennedy. If Keane is appointed it would be the former Nottingham Forest and Celtic midfielder's first steps into management after injury ended his glittering playing career in June 2006. He faces a tough challenge at Sunderland with the club bottom of the Championship after four consecutive league defeats after their relegation last season. The club were also knocked out of the Carling Cup after a 2-0 loss to lowly Bury. After the defeat Quinn announced his plans to step down from his role as temporary boss and said he was confident of bringing in "what his consortium felt was a world-class manager". 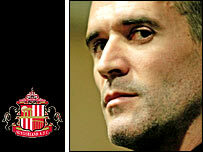 Sunderland defender Clive Clarke has welcomed the news of Keane's potential appointment. What does Roy Keane know about the Championship and its players? He said: "Roy Keane is a legend in the game and has an almighty presence about him. "You look at his career and he's always demanded high standards wherever he has been. "His biggest quality is his leadership skills. He's a born leader and has always inspired people around him. "He lives and breathes football and it looks like he's coming into Sunderland at just the right time. "Yes, he is very demanding but maybe that's exactly what we need to start getting results." Ex-Sunderland skipper Gary Bennett, who is now a pundit for BBC Radio Newcastle, said: "It could be seen as a gamble by Sunderland. "But hopefully with his contacts in football and if he brings experienced people with him then Keane's reputation can attract good players to the club. "It's a big job for him, no doubt about it. But he is not going to take any messing about and he'll expect the best for the club."